You give a little, you take a little. When cooperative behaviour developed in whales, ants and primates as well as a surprising number of other organisms, it failed to leave convincing evidence for scientists. They dispute still the prevalence of some cognition and how complex it can be. Perhaps now it will be seen as more widespread! Primates are prime examples of reciprocal behaviour. Instead of an old practice of studying two animals at once, Gloria Sabbatini and her co-workers in Rome have evolved a method by which more ecological value can be gained in triads. The third individual presumably adds context to social bonding, as the work indeed proved in a skilful way. Their research is published today in the Royal Society journal, Biology Letters. The tufted capuchin (Cebus apella) is kept normally at the Istituto di Scienze e Tecnologie della Cognizione, consisting of an alpha male and two matrilineal lines. 3 compartments allowed individuals a bowl each and the ability to reach through mesh to move food to different compartments. For 2 stages of 7 minutes each, the capuchins were copiously supplied with food (apple) so that little advantage was lost for one or two of the participants, but the other(s) could be given food without much loss to the giver. With two participants, the food given in stage 2 was positively related to the amount given by the partner during stage 1. With three capuchins, again the food was given according to who gave during stage one. There was a lack of relationship between the amount of food given in the two stages. Social relationship certainly had a positive correlation with the amounts transferred however. Maintaining a kind of ecological relationship from natural companions could have affected emotional outcomes too. 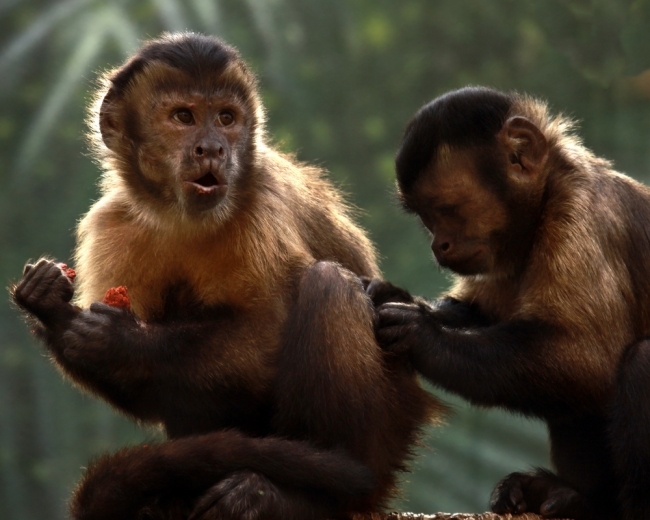 First, the food transfers between two capuchins were proven to be related to short term relations. Second, this research showed a weakening of these short-term relations when a choice between partners was there. Reciprocal behaviour in natural situations is rarely demonstrated and this could be one reason for it. But, third, there is support here to indicate that partnerships are based on social bonds that are much more long-term than a short-term exchange such as those here. With effort being made to reduce differences in relationship quality between the animals, it seems that previous chimpanzee research is in agreement with this monkey work. It did not seem that established social preferences couldn't be overcome during the time of the experiment. Dr. Sabbatini et al agree that many more such solutions to the need for valuable partners will be found to be a kind of "emotional book-keeping."